Buyers Products, a leading manufacturer of work truck equipment, releases a new series of expressway plows designed for high speed highway and interstate use. 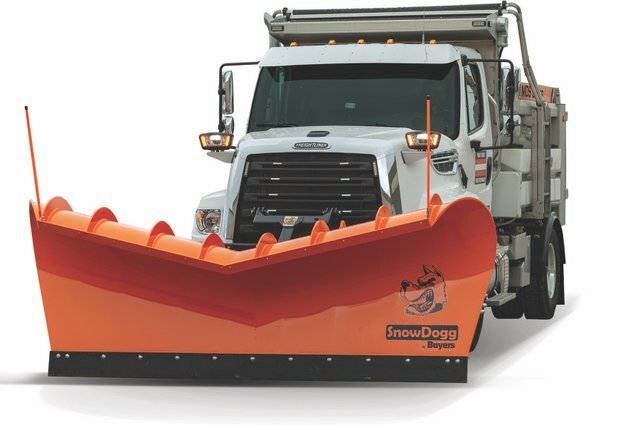 The SnowDogg Expressway Plow is the largest and most powerful option in Buyers’ growing line of SnowDogg municipal plows. The hydraulically reversible plow features a massive flared steel moldboard with a roll-formed top. The construction results in an integral deflector that stands 40 inches high in the middle and 56 inches at either end. This makes the plow throw snow farther than a traditional straight-blade and it helps improve visibility for the operator by reducing drift. Other highlights include a tubular steel push frame that spans across all the moldboard ribs and a ¾-inch angular sector that provides the strength and durability needed to plow large amounts of heavy snow at high speeds. The series is available in 10-gauge, 304 stainless steel or Tuff Kote powder-coated 7-gauge carbon steel, with a trip edge or full trip. SnowDogg Expressway Plows will be available for the 2019/2020 winter season. SnowDogg distributors and dealers can order during Buyers Products’ pre-season order period later this spring. For more info on Buyers Products, click this link. It’s super clickable.